The magnetic polarity of the earth is at its peak as it arcs between the north and south poles. In February 2000, NASA launched its Imager for Magnetopause-to-Aurora Global Exploration (IMAGE) satellite to observe and map these electro-magnetic fields of the earth’s poles from deep space. The results showed magnetic fields in a display resembling those experiments we did in elementary school with magnets and iron fillings. It is this electro-magnetic field pulsating around the globe that is responsible for the aurora borealis. The house of ice, or igloo, has long been associated with the Inuit people, and it too is indigenous to the arctic regions surrounding the north pole. In fact, the architectural form of the igloo echoes the global space that the Inuit have inhabited for centuries. The conceptual seed of Corvus Corax (Raven) has been germinating since 1980, when I observed the aurora borealis for the first time. I had traveled to the arctic-circle to set up an intaglio print shop with the Inuit community at Cape Dorset, Nunuvit, Canada. What has become increasing clear to me since then is that, in a larger sense, unique forces of nature provide unique settings for particular human communities, and that natural phenomena are reflected in their cultural identities. 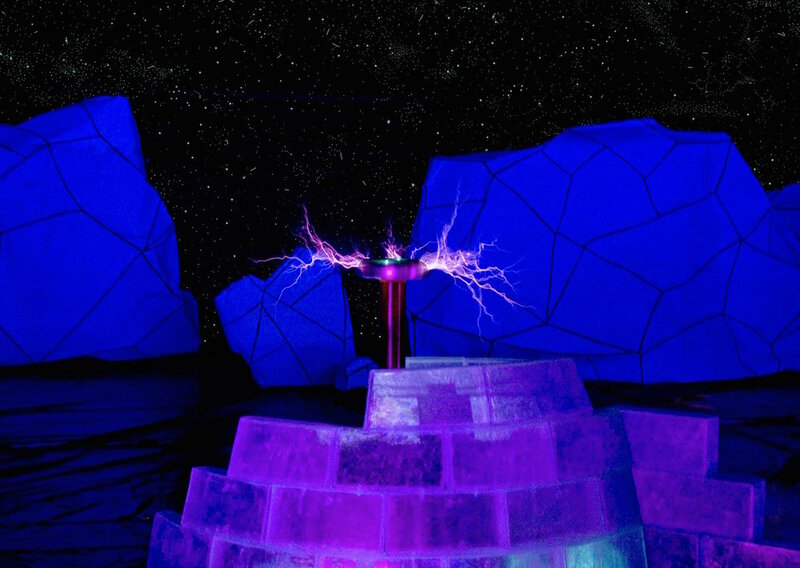 Perhaps the most dramatic manifestation of magnetic global arcing was developed by Nikola Tesla, whose famous coil recreates some sense of the natural forces at play in the charged land of the Inuit. 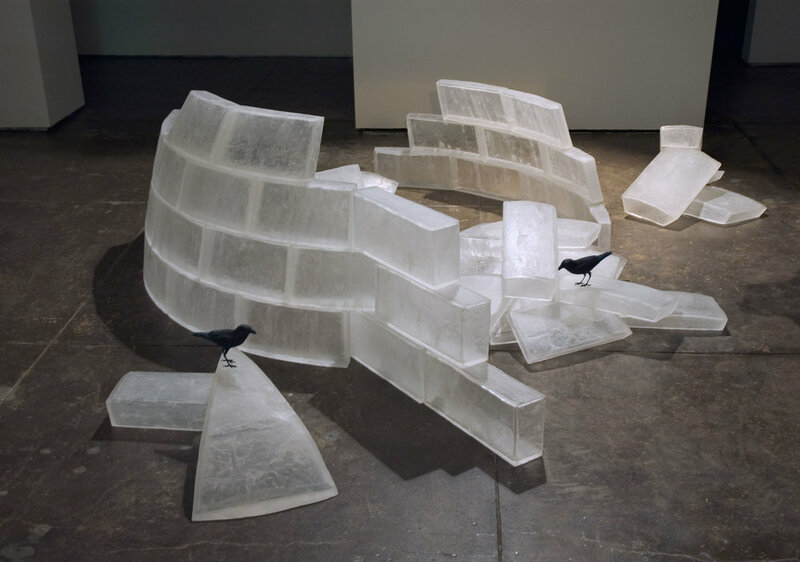 This installation combines architectural form, electromagnetic energy, and the questioning figure of the Inuit’s Raven to suggest real and mythical urgency in the building and/or destruction of our cultural worlds. The Ozone Room began in the ozone-laced atmosphere of a former cold storage facility in Tieton, Washington. While there for an event, Packer noticed a portal in one of the walls…. In 2005, Packer completed Corvus Corax. Dramatic color and lighting effects illuminated a collection of ice-like objects, with an igloo as the central point. The actions of dancers, uniquely lit, implied new questions – of time and space, of other life in the universe, of human survival in impossibly harsh conditions. It was all set against a brilliantly crafted dark and starry arctic night sky. Following Corvus Corax, the artist expanded his conceptual exploration, crafting in brass the next phase of his vision – his large dodecahedron, the Time Machine. Allan and filmmaker Nuno Cera then collaborated on a Time Machine film. Filmed on Washington’s windswept coast and in a lush nearby rainforest, the short film is rich with imagery and evocatively scored by Seattle-based composer Michael Shuler. The Ozone Room brings Allan Packer’s conceptual process to its culmination, presenting the sculpture and film of the Time Machine with the Corvus Corax installation. Experiencing the combined halves of Allan’s vision will create a surreal experience for the visitor. Within the theatre, the Time Machine film will be screened. Then, reality will seem to distort as the film becomes three-dimensional objects, and the igloo installation begins, bringing us fully into real time. Theatre, music, paintings, sculpture, film, dance…and science – The Ozone Room is a unique, large-scale art event.